Peterborough United manager Darren Ferguson has told his squad they need to win eight more Championship games to guarantee survival this season. Posh are six points behind fourth-from-bottom Ipswich, but have a match in hand on the Suffolk side. 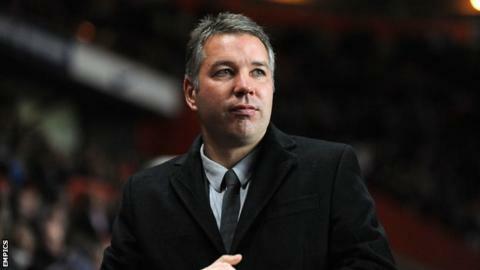 "I feel if we get eight wins out of our remaining 18 games, we will be safe," Ferguson told BBC Radio Cambridgeshire. "If we don't achieve that, then we have to get as close as we can. That's got to be the agenda." Ferguson will soon have defender Gabby Zakuani back from his Africa Cup of Nations campaign with DR Congo, while Lee Tomlin has completed a three-match ban. The Scot has also brought in Jack Payne from Gillingham, but does not expect further additions until the emergency loan window opens in February, at which point Ferguson hopes to bring West Brom's George Thorne and Saido Berahino back to London Road. Both players impressed during previous loan spells at Posh this season, but midfielder Thorne was recalled early, while striker Berahino suffered an injury. "Thorne is the one we're holding back on," said Ferguson. "He's part of their squad at the moment. I'm happy to wait, let it develop and see what happens. "West Brom have been very good to deal with. We've kept tabs on where he is. We've shown our interest and said, if we can, we'd like to bring him back because he did so well with us, which they realised and appreciated. "There's talk that Berahino is close to fitness. He's another one who really enjoyed it here."